Robert Clark has painted live at several noteworthy thoroughbred award events, including the Eclipse Awards, the National Turf Writers Awards, the Kentucky Derby Trainer’s Dinner and the White Horse Awards. Robert Clark’s first equine artwork shows were is 1982 at the Arabian Nationals at Freedom Hall in Louisville and the Egyptian Event at the Kentucky Horse Park. The following decade would bring his selection of the thoroughbred as his breed of choice. Since the early 1990s, Robert has painted more than 200 graded stakes winners, including more than 20 Kentucky Derby winners. His body of work is highlighted by the book “A Brush with Greatness,” a joint project featuring his artwork and thoughtful essays written by Eclipse Award winning author Edward L. Bowen. The books spotlights more than 75 Grade 1 stakes winners in masterfully painted portraits accented by colorful quotes from the horse’s connections, including owners, trainers and breeders. 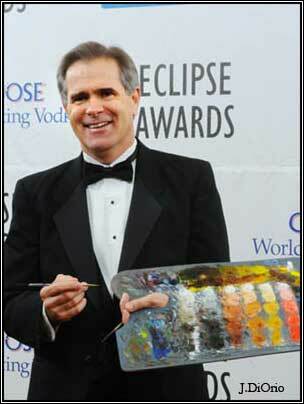 Throughout his dynamic career, Robert has been invited to paint live at many of the racetracks across the country. In 2008, he was the artist-in-residence at Gulfstream Park, where more than 40 of his pieces are in the track collection. His paintings are also showcased in private collections across the globe and the 150th Anniversary Horse he created for the race track at Saratoga is on permanent display in the National Museum of Racing and Hall of Fame. Robert has also painted live at the Eclipse Awards, the National Turf Writers Awards, the Kentucky Derby Trainer’s Dinner and the White Horse Awards. Robert started painting landscapes as a child. His high school art teacher borrowed one of his paintings and secretly entered it into a show with professional artists. His painting won best of show. Robert would later attend the University of the South at Sewanee as a Wilkens Scholar. During that time, he continued to refine his skills by constantly drawing and painting from life. It was that intense training in drawing that provides the foundation of his realistic style of artwork today. Later, Robert earned a Bachelor of Fine Arts degree with honors from Florida Atlantic University in Boca Raton. Robert’s historic art influences include William Turner, Edgar Degas and Theodore Gericault. Each of these artists demonstrated both precision with their drawing as well as the ability to be loose and free with their brushes. In addition to his academic training, Robert credits the development of his craftsmanship to two fellow artists – Jon Houghton, a portrait artist, and Ron Stark, a sports artist. All three shared their techniques and experiences. For example, Robert’s meticulous palette layout has been the same every day for decades since he learned it from Houghton, who had apprenticed with Hall of Fame portrait artist Daniel Greene. Robert’s contemporary equestrian art influences include Richard Stone Reeves and Peter Williams. He has constantly striven to improve as an artist while focusing on horses as his primary subject. Notably, it’s been 37 years since his first show in Kentucky. The horses may change every year, but his passion to paint them is constant. Robert’s artwork can be seen during the months of April and May at The Brown Hotel’s Derby Art Show. His work can also be viewed at the Robert Clark Artist Gallery at 137 E. Main St. in Georgetown or on his website: www.robertclark.us. My mission is to portray the greatest race horses of this generation using the skills developed over a lifetime. The sum total of these paintings are intended to create a visual fine art record of the sport of horse racing and my legacy as an equine artist.